Splendid readers! The hardlysmoking staff could use your help in sorting this headscratcher out. Over the past several days we’ve encountered two radically different reports on the relative merits/hazards of electronic cigarettes, and we can’t quite figure out which one is right. Start with this piece in The Guardian (tip o’ the pixel to the Daily Beast). As far as e-cigs being a gateway to cigarette smoking, the PHE study says that kind of thinking is, well, vapid. There was no suggestion that the products were a gateway into tobacco smoking, with less than 1% of adults or young people who had never smoked becoming regular cigarette users. The same day, this report appeared in the Wall Street Journal. Ninth-graders who used electronic cigarettes were more likely to smoke cigarettes, cigars or hookahs than peers who never tried the battery-powered devices, a study in the Journal of the American Medical Association found. The research is some of the first to address fear among health officials that e-cigarettes could become a gateway to traditional cigarettes. 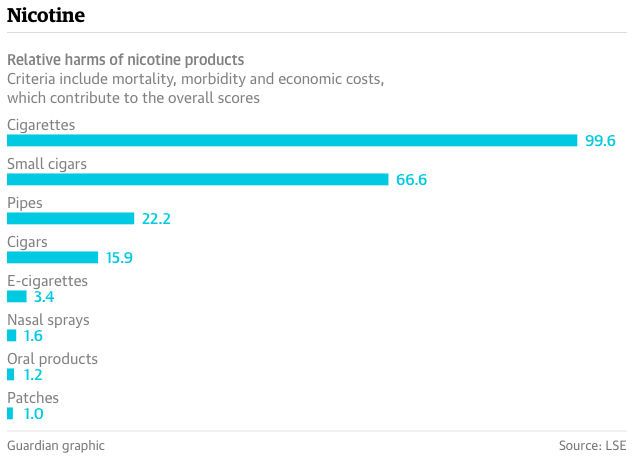 The results come as the largely unregulated $3.5 billion e-cigarette industry faces mounting criticism from health groups and lawmakers concerned about teens using the devices, which heat liquid nicotine into vapor. The study focused on ninth-graders at 10 public schools in Los Angeles who had tried e-cigarettes before the fall of 2013. Researchers surveyed those students in the spring of 2014 and fall of 2014, and discovered that they were about 2½ times as likely as their peers to have smoked traditional cigarettes, five times as likely to have smoked cigars, and three times as likely to have smoked hookahs. So . . . what? 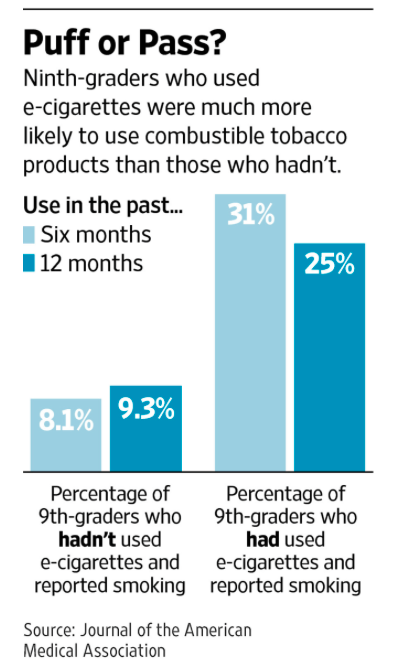 Teens are four times more likely to use real cigarettes? Or barely likely to move from vaping to flaming? This entry was posted in Uncategorized and tagged Daily Beast, e-cigarettes, JAMA, Journal of the American Medical Association, PHE, Public Health England, The Guardian, Tripp Mickle, vaping. Bookmark the permalink. Vaping “tobacco”? Seriously? HWS, please – wake up and smell the doses. Wait – who said vaping tobacco? Really? I must have read it too late at night.